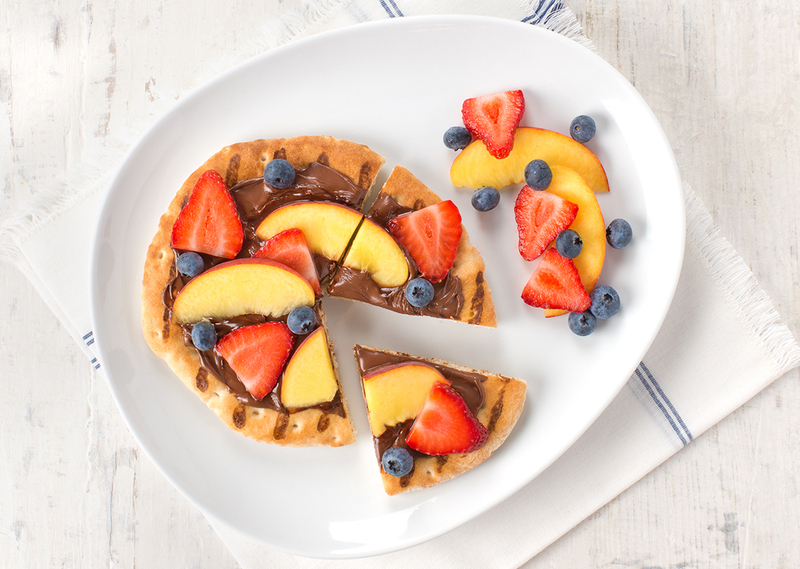 Here's a quick and easy chocolate-y dessert with a healthy spin from fresh fruit toppings. Preheat your George Foreman Grill for 5 minutes with the lid closed. Place pitas on grill and cook for 2 to 3 minutes or until grill marked and toasted. Spread each with chocolate hazelnut spread. Arrange peaches, strawberries and blueberries on top as desired. Spoon yogurt into resealable bag; snip corner. Drizzle yogurt on top of fruit. Tip: Use your favorite fresh fruit for this pizza; try bananas, kiwis or raspberries too. For the Indoor/Outdoor grill, preheat the grill to setting 3 and cook for 4 minutes covered.